Georgy Litichevsky was born in Dnepropetrovsk, Ukraine in 1956. He was graduated from the history department of Moscow State University in 1979. In 1986 initiated George & George art group together with Georgy Ostretsov. 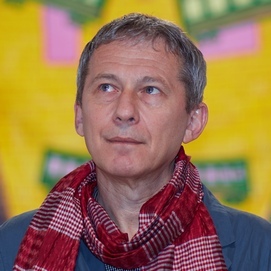 In 1990 Litichevsky became a member of the City Committee of Graphic Artists. The same year he began working in the BOLI group (F.Bogdalov – G.Litichevsky). He has been a member of the editorial board of «Khudozhestvennaya Zhizn» magazine since 1993. His works are held in the collection of contemporary art of Tsaritsino Museum, Moscow and in private colletions in Russia, Belgium, Switzerland, Italy, France, Germany. Litichevsky has participated in numerous exhibitions and auctions, including more than twelve solo exhibitions and more than forty group exhibitions throughout the world.